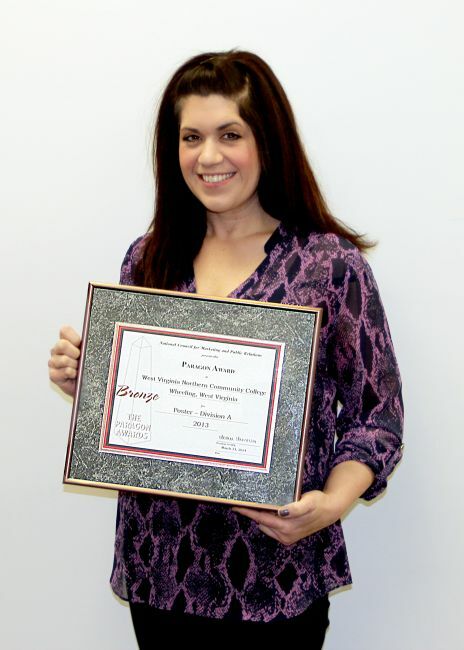 Hilary Curto, graphic artist and webmaster for West Virginia Northern Community College, has been awarded the Bronze in this year’s Paragon Awards contest of the National Council for Marketing and Public Relations. Curto, of Moundsville, won national recognition for the poster she created regarding Northern’s tobacco-free campuses. According to NCMPR, more than 80 marketing and public relations professionals from throughout the country donated their time to review and score nearly 1,900 Paragon entries this year. WVNCC was the only West Virginia institution honored in this year’s contest. NCMPR conducts the only national competition of its kind that honors excellence exclusively among marketing and PR professionals at two-year colleges.